Today marks the 13th anniversary of a major disaster that struck Teziutlán (current population about 65,000), a small city in the Eastern Sierra Madre, in the northeast corner of the state of Puebla, close to the border with Veracruz. The city is noteworthy as the birthplace of two prominent twentieth-century politicians: Manuel Ávila Camacho (served as President, 1940–1946) and Vicente Lombardo Toledano, who founded the Confederación de Trabajadores de México (CTM), Mexico’s largest confederation of labor unions. The town’s name means “place of the hailstones”. But in 1999, it was not hailstones but torrential rain that triggered the major disaster of 4/5 October, with parts of the city destroyed by a series of landslides and mudflows. More than 80 municipalities were affected to some degree by this tremendous storm. Hundreds of landslides occurred in Hidalgo, Veracruz and Puebla states, causing an estimated US$457 million worth of damage, and at least 260 deaths. This post focuses only on the consequences for Teziutlán where several hundred homes were completely destroyed and almost a thousand homes suffered partial damage. More than 100 Teziutlán residents lost their life. The local infrastructure, roads, housing, schools and farming were all severely impacted. The worst damage was in the La Aurrora district on the eastern side of the city, where a landslide on a 23-degree slope buried more than 130 people. In another district, La Gloria, in the western part of the city, several more slips, flows and slides damaged homes, but without any fatalities. With the benefit of hindsight, this disaster offers a good case study of the factors which made the inhabitants of Teziutlán particularly vulnerable to such an event. The diagram suggests one general classification of the multitude of factors that can affect vulnerability. In the case of Teziutlán, the discussion that follows suggests that the physical factors were probably the most significant. 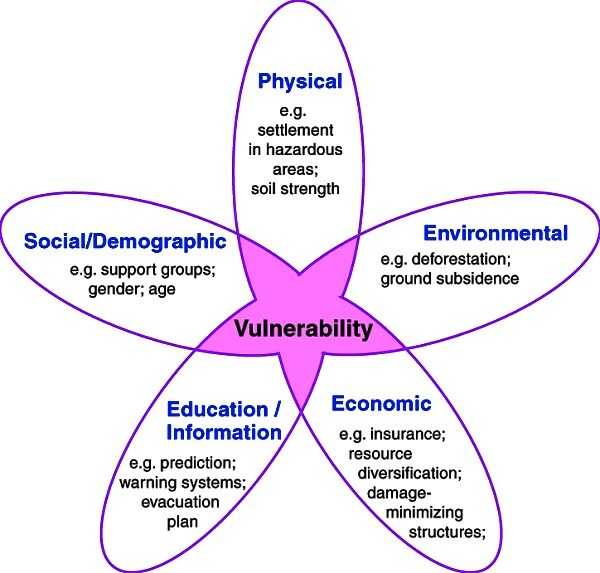 Factors affecting vulnerability (Geo-Mexico, Figure 7.2) All rights reserved. 1. Relief and geology. The area ranges in elevation from 300-2,280 meters above sea level and is drained by the El Calvario, Xóloatl and Xoloco rivers. The city is located at the southern limit of the Eastern Sierra Madre (Sierra Madre Oriental), very close to where it is truncated by the geologically more recent Volcanic Axis. The local geology includes a series of loosely compacted, pumice-rich pyroclastic flows, most of which are thought to be associated with the Los Humeros caldera. These deposits are interlaced with palaeosoils rich in clay which are impermeable and restrict the infiltration of rainwater, and overlie older folded rocks. The combination of steep slopes and impermeable, unconsolidated layers increases the risk of landslides and other forms of mass movement. 2. Climate. This mountainous region is one of the most humid and foggiest in Mexico, averaging 280 days of mist or fog each year. Teziutlán has an average precipitation of 1600 mm/yr, though totals of over 2000mm are not that uncommon. Most rain falls between July and October.On 4 October 1999, a moist tropical depression off the coast of Veracruz was prevented from moving by a cold front. This led to an increase in humidity followed by torrential downpours (over 300 mm of rain) over Teziutlán and the surrounding area. The storm continued the next day when a further 360 mm of rain fell. The rain that fell on just those two days was equivalent to about 40% of Teziutlán’s usual total for an entire year. 3. Earthquake A few days prior to the storm, on 30 September 1999, a 7.4-magnitude earthquake occurred off the coast of Puerto Escondido (Oaxaca). This earthquake did cause minor cracks in some homes in Teziutlán, and it possibly played a (minor) contributory role in the severity of the storm’s impacts. Deforestation, as a consequence of unplanned urban growth, was also important. Natural and secondary woodlands were steadily being cleared for construction and agriculture. This had an adverse effect on infiltration rates and the capacity of the land to absorb rainwater. However, given the extreme magnitude of the rainfall event, it is unlikely that the area would have escaped unscathed, even if the natural forest had remained. In the La Aurrora district, where a landslide/mudflow buried more than 130 people, the construction of a cemetery on a hill above La Aurrora may have played a part, since it appears that a cemetery wall held rainwater back, allowing more of it to seep into the underlying slope, increasing its susceptibility to a serious slide. The town had suffered severe mass movements during prior storms. For example, in 1955, the rains that accompanied Hurricane Janet provoked numerous mass movements resulting in the disruption of transport systems, including the main highway, but with no loss of life. However, in general, it is clear that these prior events did not increase Teziutlán’s preparedness for a similar event in the future. In particular, prior events did not lead to building regulations being enforced or prevent buildings from being erected in high-risk areas. In the period following the last major event (in 1955), the population of Teziutlán had increased rapidly, leading to the equally rapid expansion of the urban area. This was uncontrolled and included construction on steep slopes with insufficient attention to stability or possible mass movement mitigation measures being taken. It is worth noting that the population has continued to increase rapidly since the disaster, too. Home owners in Mexico do not generally carry insurance on their properties, and even when they do, it often specifically excludes major meteorological events. It is unlikely that any of the residents of Teziutlán were able to make insurance claims. Many of the those affected would not have had savings and would have been forced to rely on family, friends and emergency hand-outs to survive. As a 1999 BBC News article emphasizes, government help was slow to arrive. There are several Youtube videos with images of the disaster. Perhaps the most interesting is TEZIUTLAN 1999 – 10 años Después del desastre because it includes some clips from an investigative 1995 TV program aired in 1995 (four years prior to the landslide) that highlighted the extreme risk of constructing unauthorized buildings on the steep slopes of the town along the main highway. This video includes many excellent photos [warning: some graphic images] of the landslide and its aftermath, with a commentary [in Spanish]. 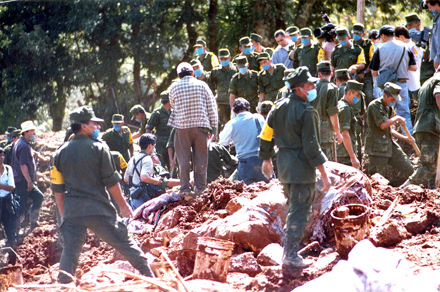 Other valuable Youtube resources include Teziutlan Desastre 1999 which has additional photos, plus some eyewitness memories of the event [in Spanish], and TEZIUTLAN historia y tragedia which has many photos of the disaster, accompanied by music only (no commentary) making it a good choice for English-speaking classes. Alcántara-Ayala, I. Flowing Mountains in Mexico. Mountain Research and Development, Vol 24, No. 1, Feb. 2004: 10-13.